This module provides a growing library of templates of common quantum machine learning circuit architectures that can be used to easily build, evaluate, and train more complex quantum machine learning models. The templates below are constructed out of structured combinations of the quantum operations provided by PennyLane. As a result, you should follow all the rules of quantum operations when you use templates. For example template functions can only be used within a valid pennylane.qnode. The function CVNeuralNet() implements the continuous-variable neural network architecture from [R3]. Provided with a suitable array of weights, such neural networks can be easily constructed and trained with PennyLane. StronglyEntanglingCircuit(weights[, …]) A strongly entangling circuit. StronglyEntanglingCircuitBlock(weights[, …]) An individual block of a strongly entangling circuit. Interferometer(theta, phi, varphi, wires) General linear interferometer. Constructs the strongly entangling circuit used in the circuit-centric quantum classifier [R2] with len(weights) blocks on the \(N\) wires with the provided weights. Each element of weights must be a an array of size \(3N\). An individual block of a strongly entangling circuit. Implements the CV Quantum Neural Network (CVQNN) architecture from [R3] for an arbitrary number of wires and layers. The weights parameter is a nested list. Its first dimension is equal to the number of layers. Each entry is again a list that contains the parameters feeding into CVNeuralNetLayer(). Implements a single layer from the the CV Quantum Neural Network (CVQNN) architecture of [R3] over \(N\) wires. The CV neural network architecture includes Kerr operations. Make sure to use a suitable device, such as the strawberryfields.fock device of the PennyLane-SF plugin. For \(N\) wires, the general interferometer is specified by providing \(N(N-1)\) transmittivity angles \(\theta\) and the same number of phase angles \(\phi\), as well as either \(N-1\) or \(N\) additional rotation parameters \(\varphi\). For the parametrization of a universal interferometer \(N-1\) such rotation parameters are sufficient. If \(N\) rotation parameters are given, the interferometer is over parametrized, but the resulting circuit is more symmetric, which can be advantageous. 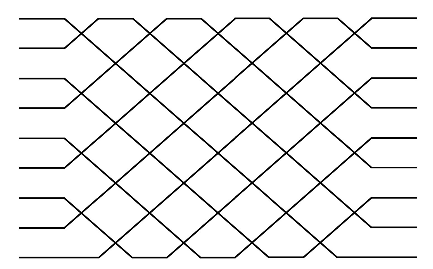 mesh='rectangular' (default): uses the scheme described in [R4], resulting in a rectangular array of \(N(N-1)/2\) beamsplitters arranged in \(N\) layers and numbered from left to right and top to bottom in each layer. The first beamsplitters acts on wires \(0\) and \(1\). mesh='triangular': uses the scheme described in [R5], resulting in a triangular array of \(N(N-1)/2\) beamsplitters arranged in \(2N-3\) layers and numbered from left to right and top to bottom. The first and forth beamsplitters act on wires \(N-1\) and \(N\), the second on \(N-2\) and \(N-1\), and the third on \(N-3\) and \(N-2\), and so on. In both schemes, the network of Beamsplitter operations is followed by \(N\) (or \(N-1\)) local Rotation Operations. In the latter case, the rotation on the last wire is left out. The rectangular decomposition is generally advantageous, as it has a lower circuit depth (\(N\) vs \(2N-3\)) and optical depth than the triangular decomposition, resulting in reduced optical loss. For the universality of the decomposition, the used convention is irrelevant, but for a given set of angles the resulting interferometers will be different. If an interferometer consistent with the convention from [R4] is needed, the optional keyword argument beamsplitter='clements' can be specified. This will result in each Beamsplitter being preceded by a Rotation and thus increase the number of elementary operations in the circuit.